This Port Angeles car garage comes with a luxury home and an incredible panoramic water view. Looking across to Victoria, B.C., this is one of the most beautiful luxury homes on the Olympic Peninsula with 10 acres backed up to mountain forests with ultimate privacy. The kitchen is a chef’s dream. Then there are several garages + a 30×40 Port Angeles car garage well equipped. The house is completely wired with fiber optics, and every outlet and every light is programmable. Watch the video for a special viewing of this Port Angeles car garage. 30′ X 40′ free-standing shop, fully finished, complete shop/garage, 20′ automatic garage door, double man doors with finishing pad, 8000 Ib. post vehicle lift, compressor, entire building plumbed with outlets for compressor, sand/parts blasting station, hot and cold running water, built-in enter-tainment center, wired for cable, satellite and internet, 16′ built-in shop bench, storage shelving throughout, full security system, welding station, multiple pegboard walls for storage, wired for both 120 and 220, plus 36′ x 25′ garage with 3 individual bays and 2 oversized bays, automatic openers, built-in utility shower/dog wash station, 11′ x 9′ utility room, wired for multiple refrigerator/freezers, plus carport for your trailer or extra cars, 30′ x 14′ paved, covered carport, 10′ x 10′ sealed utility storage unit (perfect for mower/atv & attachments], with built-in shelving. This is one of a kind and when it’s gone, there isn’t another like it in the entire Northwest. Call Chuck Marunde for a private viewing of this Port Angeles Car Garage. This Port Angeles home with acreage has privacy at the end of a private road and is surrounded by trees on three sides and a large open field on the other side. 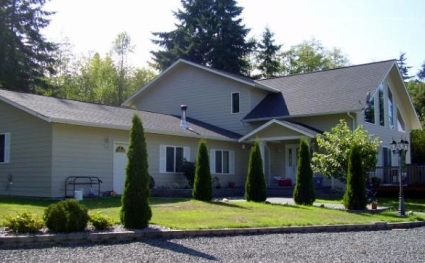 With 3.7 acres several miles outside the city and surrounded by other large parcels and farms, this is a rare Port Angeles home with acreage in this market. It is very hard to find property like this with a little acreage and privacy. This is not a new home. It was built in 1978, but this is the reason it is only $229,000. It does need some upgrading, but it is in very good condition just like it is. It is ready to move into, and it is quite comfortable. The daylight basement walls and ceiling were recently finished, although the concrete floor has been left bare for you to add your own flooring. There is a huge wood stove in the basement, and there’s a brick fireplace on the main floor. Many retirees have been asking me for years for an affordable home on 2 to 5 acres with some privacy. This is it! Believe me, it is hard to find a Port Angeles home with acreage and privacy. This property will probably sell fairly quickly simply because it is rare. The listing price is set at a sellable price in this market. You can learn more about this home, see more information and more photos at Port Angeles Home with Acreage. Are Port Angeles homes selling? The answer will be similar to the question, “Are Sequim homes selling?” The answer is that the best homes in the best areas at the best prices are in fact selling, and they are selling just like they did before the real estate recession. Yesterday, I wrote an offer on a Port Angeles home. When I wrote the offer, the house was available and “active” in the MLS. My client signed the offer, wrote an earnest money check, and I submitted the offer promptly to the listing agent. As always, I called the listing agent to tell her I submitted the offer via email. She called back to tell me an offer had been accepted just hours earlier. This morning that listing still shows as active in the MLS, although it is pending. This is proof again that the real estate market here is bifurcated, meaning that there are essentially two markets. One market includes a large inventory of Port Angeles homes that are not selling very well, many of which have been on the market for a long time. The other market, or the other segment of the market, consists of homes that qualified buyers do want. These homes probably make up only 2% or 3% of the inventory, but these homes are consistently selling within a reasonable period of time. Not only are these homes in this smaller segment of the market selling in a reasonable period of time, many are selling at full price, and there is competition in buying them. The offer I wrote yesterday was beat by another offer by a matter of hours. Last month I wrote about another Port Angeles home that I wrote an offer on, and that one also was sold the same day by a second offer that was at full price. I sold another Port Angeles home a few weeks ago at full price that had another buyer who told the listing agent he wanted to write a backup offer. Here’s the point. If you see a home that fits your search parameters, and it is what you would consider the best home for you in the best area at a reasonable price, do not waste any time submitting an offer, because you can bet there is someone else, and maybe several buyers who think like you do, and who are also looking. I can tell you that my buyers who have missed out because another offer was accepted on the same day were very disappointed. Let me emphasis that this segment of the market is small. The vast majority of the Port Angeles homes market is still behaving as though we are in a real estate recession. It is only the smaller segment consisting of maybe 2% to 3% of the inventory that is behaving like a healthy market and these homes are selling. It is this small segment, however, that includes the Port Angeles homes that so many buyers want. How could a Port Angeles home for sale get stolen? Well, it did, and this is the true story of how a custom built Port Angeles home for sale was stolen. I know because I personally witnessed the entire episode. This home was originally listed for over half a million dollars, and it just sold for $227,500. We need to start at the beginning. In April of 2010 this Port Angeles home for sale was put in the MLS at a price of $550,000. It is beautiful custom built home, 3,440 square feet, hardwood floors, a kitchen with custom built cabinets, a large island, and far too many amenities to mention. You can see from the photo how beautiful this home is. There are 4 bedrooms and 3 baths, and a large entertainment area. It was built in 2007, and it sits in the country in a very private setting (you can’t see any other homes). But it gets better. This home is nestled on 10 fenced acres, which is 80% cleared. There’s a small guest home on the property, and a nice garage and shop. Believe me, this is a rare property. I showed this Port Angeles home sale several times over the years as the price slowly came down to $450,000 and after not selling for a year, it was relisted and the price raised to $495,000. I’m not kidding. There certainly can be a reason for raising a listing price, but in this case there clearly was not. After not selling for another full year, the price was reduced to $425,000. During this time, I wrote an offer on the house for what my clients (and I) felt was a reasonable fair market value in the amount of $345,000. The seller’s and their Realtor laughed at us. Finally, with a smile she brought out the file. The owner had built this entire house without any building permit. Is that amazing or what! My clients as buyers would have to get permits in order for the house to be inhabitable legally. The county told us there would have to be inspections of the inside of the house walls, the electrical, the plumbing, the foundation, the construction of the home, the roof, and so on. If it all complied with the building code, the permit fees plus penalties would have to be paid. Of course I called the listing agent and asked if she knew the house was never permitted, and if she did, why was it not on the MLS data sheets and disclosed. I never got an answer, and the MLS data sheets in the weeks to follow never did disclose that this house was completely illegal and umpermitted. Amazing. 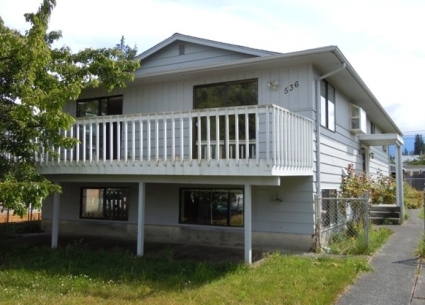 This Port Angeles home for sale just sold at a foreclosure sale for $227,500. Absolutely amazing. I wonder if the new owner even knows that the house has no building permit. However the new owner may have paid for it (with or without a loan), she certainly got one of the bargains of the century. This Port Angeles home for sale was stolen. 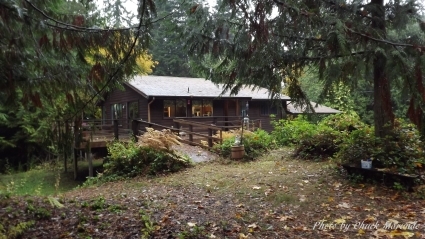 This Port Angeles home for sale comes with a huge shop with plenty of acreage. And this Port Angeles home for sale is also a woman’s ideal floor plan. The kitchen is incredible, and you’ll see more on this video tour, but there is also an large sewing room that ends the discussion for sewing or hobby rooms altogether. This home has been dramatically reduced in price, so some lucky buyer is going to take advantage of this buyer’s market. This Port Angeles custom home was built with quality in mind, and the setting is private with a peek-a-boo water view. The kitchen has the largest island you’ll see with a second kitchen area the sellers call the butler’s kitchen. The master bedroom is on the top floor with large windows, and the daylight basement has a mother-in-law living area or recreation area. This property has a big shop building with a parking lot all separate from the house on this 4.88 acre parcel. Call me or email me for a viewing of this one of a kind Port Angeles Home for sale. Sequim investors cannot find great deals on homes in Sequim. They are literally unable to find good investment properties to buy with cash. You would think that in this recession that there would be many homes at incredible bargain prices, and that Sequim investors would be swooping in to snap them up, but such deals do not seem to exist in our market. Why is that? The headlines around the country for quite a while have been all about the large numbers of foreclosures flooding the market, the crashing housing prices, the home builders going bankrupt, and the mortgage debacle. Stories are told again and again about the guy who bought a three bedroom home in Vegas for $75,000, or the couple who bought a four bedroom mountain view home on 20 acres in Arizona for $225,000. Stories abound. So why can’t Sequim investors find these extraordinary deals? They don’t exist in Sequim. Nor do they exist in Port Angeles. It sure seems like they should, but they don’t. I have cash buyers waiting for me to find an extraordinary deal. Try as I might, and I look at a lot of homes in the area, I have not found a home that a Sequim investor could buy, put $20,000 into it with their own labor, and re-sell for a profit. Sequim Investors Say Where Are The Deals? Some might think there are many homes for sale, and there are, but not the kind that can be resold within six months for a profit. Sequim buyers, and this means retirees from outside the area, are not interested in 1970’s style homes with a split level floor plan, or an unusual floor plan, or a home in an unfavorable area. Investors won’t touch these kinds of homes, because they cannot sell them. If I could find a post-1990 three bedroom, two bath home with a normal floor plan, a roomy kitchen with plenty of cabinet and countertop space and about 2,400 square feet on a nice one acre lot with a mountain view of some kind, one that needed some remodeling and cosmetic work and could be purchased for about $185,000, I could sell that to an investor in a heartbeat. He would put about $20,000 to $30,000 into it, lots of labor, and resell it for $240,000. That would work, but believe it or not, this kind of investment does not exist. There are homes like this, but the owners want $240,000 for them now, and that leaves no room for investors to profit. Unlike many areas in the country, the bottom of the Sequim real estate market never fell dramatically. While this news has been disappointing to Sequim Investors, it is actually a sign of stability and strength in the Sequim housing market, and this bodes well for sellers as well as buyers. Buyers won’t find the steal of the century here, but they will buy a home in a stable market and that is a good thing. Sequim investors may have to look to Vegas or Phoenix to investor their money, and even that will be fraught with significant risk. Chuck Marunde is pleased to announce that he acted as a Buyer’s Agent in the sale of another home in Port Angeles. This home is a four bedroom, two bath, two story home with 2,600 square feet on a Port Angeles city lot. It’s a nice neighborhood. This home is a Bank of America foreclosure and was listed at $177,000 and sold for $128,000. Don’t expect to find many deals like this. This was one of the best prices I’ve seen in this area. You can search for both Port Angeles homes and Sequim homes for sale with one of the best online MLS search sites, and it requires no personal information or registration from you: Sequim Homes for Sale (includes Port Angeles). The massive Port Angeles Walmart Supercenter is open for business. The new supercenter was built in the same location of the old K-Mart that went out of business. The center is surprisingly large. The size is not so obvious when you drive into the parking lot, but as you walk into this Port Angeles Walmart Supercenter, you realize that it might be a good idea to have a golf cart. Unless you intend to walk a couple of miles for exercise, you will want to make sure that you don’t need items from opposite ends of the store. If you thought the Sequim Home Depot or Sequim Costco is big, think again. Both of those stores might fit inside this Walmart Supercenter. The Port Angeles Walmart Supercenter is welcomed by some locals and cursed by others. It is the continuing battle between the big box store and the small local businesses owners. It is a very real battle, and Walmart has an extraordinary advantage when it comes to buying large volumes at big discounts and passing those discounts on to consumers in ways that local businesses cannot. While many of us as local business owners want to and do support other local businesses, sometimes the decision regarding our own finances pulls us into Walmart. This is true especially in this recession, and it is also the reason this Port Angeles Walmart Supercenter is already very busy. A simple example will perhaps make the point. I do most of my grocery shopping at Sunny Farms in Sequim. This is an incredible family owned organic grocery store, and just about every single item I purchase there tastes substantially better than the mass produced and processed foods at my local Safeway. Of course, QFC is a few levels above Safeway in terms of quality food, but so are the prices. The prices at Sunny Farms are higher than either of those stores, but the quality is substantially better, too. Sunny Farms has an organic cereal that I really enjoy called Autumn Wheat by Kashi. It is over $6.00 a box (17.5 ounces) at Sunny Farms, but this exact same cereal is sold at the Port Angeles Walmart for $3.50. I was surprised they even carried it, but at almost half the price. I admit I buy several boxes of it at Walmart to save a lot of money. You can bet that Sunny Farms’ own wholesale purchase price of this cereal is more than Walmart’s retail price. This is why a small business cannot get into a price war with Walmart. I’m certain that many will be shopping for Christmas gifts at Walmart. Local businesses continue to close, and I observed another business closed and empty in Port Angeles yesterday. Local businesses are going to have to be creative and grab ahold of technology and Internet marketing to survive and thrive. They cannot and should not try to compete on prices. Walmart will win that battle every time. The battle must be won on quality, customer service, and other levels. If you haven’t seen it already, you’ve got to see this massive Port Angeles Walmart Supercenter just for the shear entertainment. 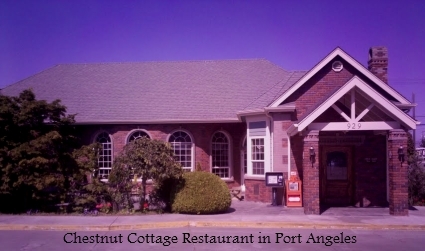 Port Angeles has some great restaurants, as does Sequim. One of my favorites is a classy restaurant named the Chestnut Cottage. If you like a really great lunch salad with some of the tastiest ingredients and freshest, you’ll love the Cobb Salad. Look, I’m a bachelor, so I’m no Chef or gourmet of anything, except Lattes (short, double shot, extra hot), but I know an incredible salad when I eat it. Let your mouth water at the thought of fresh salad greens, tomatoes, onions, still hot bacon pieces, Avocado, slices of hard boiled eggs, chunks of Roquefort, and croutons. All very fresh, and arranged on a plate like a picture in a magazine. Well, you get the idea. For those among you who are visiting and looking at real estate, I highly recommend a mid-day break at the Chestnut Cottage for lunch. And to help you recognize it when you drive into town, I took this photo from my Android cell phone. By the way, if you are my clients, I buy my clients lunch here when we are looking at property. 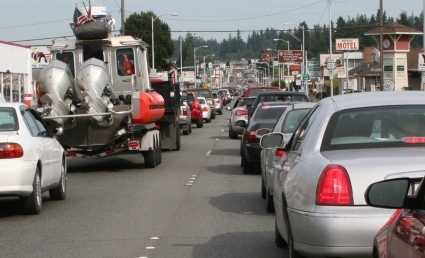 Friday rush hour traffic in Port Angeles doesn’t last long, but it does bring back memories of bumper to bumper traffic on I-5, I-405, and if you’re from L.A., this will be nothing. 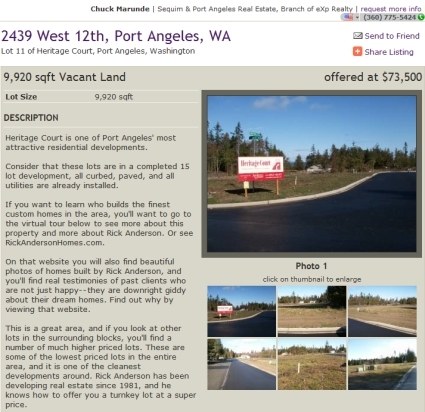 Interested in Port Angeles land for sale in a great subdivision? There may be a large inventory of existing homes on the market, but many retirees from California and elsewhere are not finding that perfect home with the kitchen just the way they want it, or with the right floor plan. Some who find a home with an acceptable kitchen and a reasonably acceptable floor plan often do not like the location. So do what some retirees are doing. Buy a lot in the perfect location and have a quality home builder create that perfect home for you. Here is a subdivision developed by one of the areas premier developers and home builders. Take a look at this Port Angeles subdivision by clicking on the image below. For another view see Port Angeles land for sale. This home is no longer available. West Port Angeles 3 bedroom, 2 bath ranch home just a few hundred yards from a park. This home was completely rehabbed in 2004, so it is like new throughout and ready to move into. It has a beautiful brick fireplace maintained by a pro annually, custom wood shutters, interior vertical blinds, all new doors and windows, full roof gutters just cleaned, and the roof is a new 30 year roof. 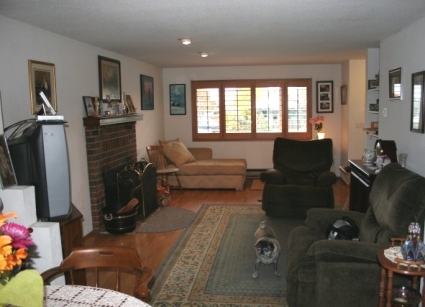 This home is in perfect condition, and if you have a dog, being a few hundred yards from a park is perfect. The owner had a large motor home parked in the back yard. And this home is handicap accessible. OPEN HOUSE ON SUNDAY, APRIL 11TH FROM 1:00 TO 4:00. COME SEE THIS HOME AT 1428 WEST 7TH STREET, PORT ANGELES, WASHINGTON. Salt Creek is a gorgeous recreation area west of Port Angeles with some beautiful beaches. There are some old WWII bunkers still in the ground overlooking the Strait, and lots of beach to walk. There’s even overnight camping. I thought you might enjoy this video of Salt Creek. 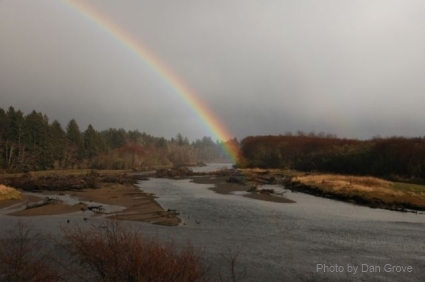 The La Push and Quileute rivers empty into the Pacific Ocean, and this photo captures a rainbow of hope. This photo was not touched up or edited. The photographer is Dan Grove. The Quileute Tribe is located in La Push, Washington, on the shores of the Pacific Ocean The Quileute Tribes have lived and hunted in this area for thousands of years. Although the village of La Push is only about one-square mile, the tribe’s original territory stretched along the shores of the Pacific from the glaciers of Mount Olympus to the rivers of rain forests. Much has changed since those times, but Quileute Elders remember “back in the days” When the “old people” dared challenge kwalla, the mighty whale, and recounted the story of how the bayak (raven) placed the sun in the sky. Because of the remote location of La Push, the Quileute have built a tourism industry that serves those seeking a relaxing getaway or a rejuvenating adventure. The tribe’s Oceanside Resort along First Beach offers ocean-view accommodations ranging from luxurious to rustic. Those who visit La Push come for whale watching in the spring; surfing, fishing, and hiking in the summer; and storm watching in the fall and winter. My thanks to Dan Grove for the great photo. 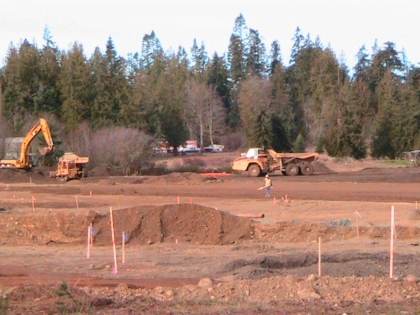 The Port Angeles Walmart, aka Walmart Super Center, is under construction and beginning to take shape. Click on this photo to see a full image. Port Angeles is watching its new Wal-Mart Supercenter currently under construction directly across from the old Wal-Mart store on the east end of Port Angeles. The new location has been a vacant commercial property for years, previously occupied by a K-Mart store. That K-Mart store went out of business a couple of years after Wal-Mart opened their store in Port Angeles. Wal-Mart Supercenters are hypermarkets with an average size of about 197,000 square feet, and they stock everything a Wal-Mart Discount Store does, plus a full-service supermarket, including meat and poultry, baked goods, delicatessen, frozen foods, dairy products, garden produce, and fresh seafood. 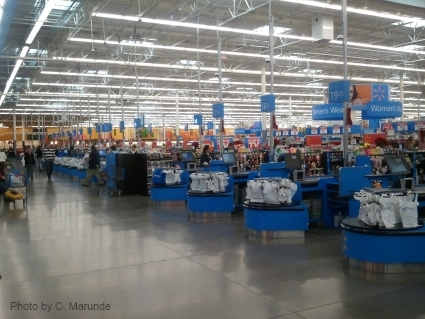 Many Wal-Mart Supercenters also have a garden center, pet shop, pharmacy, Tire & Lube Express, optical center, one-hour photo processing lab, portrait studio, and numerous alcove shops, such as cellular phone stores, hair and nail salons, video rental stores, local bank branches, and fast food outlets, such as Subway, Dunkin’ Donuts, McDonald’s or Blimpie. Some also sell gasoline distributed by Murphy Oil Corporation, Sunoco, or Tesoro. Does anyone else love to drive around and look at property, fields, mountains, and beautiful water views? 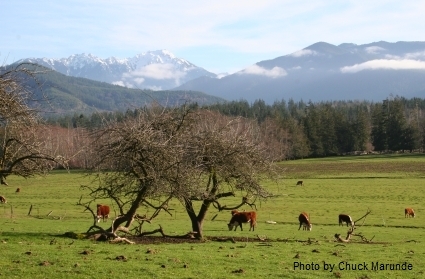 I’ve always loved to do that, and I could not resist stopping to take this photo of an idyllic view of this field of cows with a stunning backdrop of mountains west of Port Angeles. I get so tired of living in one of the most beautiful places in the world. Don’t tell anyone about Sequim and Port Angeles. They just might move here and buy this field and build a gas station. Many Port Angeles businesses are struggling to survive, and many have already closed their doors or moved. I interviewed one business owner who had a business in the central downtown district of Port Angeles. Business was so slow she moved her business to Sequim. It’s hard to know how many businesses have called it quits in this recession, but the number is big, even for a small town. Driving around town one can see For Rent signs in many store fronts. One local business owner told me there were 70 to 80 empty retail spaces in Port Angeles. 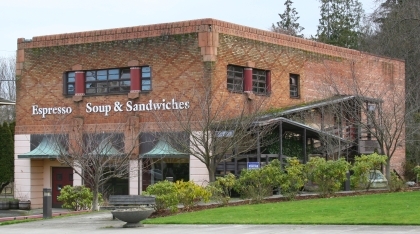 Some commercial buildings, like this one on Lincoln Street in Port Angeles, which boasted “Espresso Soup & Sandwiches” has been closed for a long time. The building is now owned by the City of Port Angeles and remains almost entirely empty. Of course, buildings like this are likely to remain empty for a while, because most entrepreneurs are not likely to start a risky business in a recession. Restaurants of all businesses are in the category near the highest risk, because they are most likely to fail within the first year. The most recent restaurant to fail in the area was the Sauer Kraut in Sequim. Retirees who want to continue working for themselves would be well advised to start a business that is not capital intensive and which has a higher probability of success. An old rule, which I think has great merit, is to stick with what you know and what you are passionate about. But I think another wise approach for any retiree who wants to be in business here is to limit risk by the business you choose, and make sure the downside is not going to financially wipe you out. This is not the time to take great risk. As with every economic cycle, there are opportunities, and I believe that even in this recession there are grand opportunities for creative and intelligent entrepreneurs to make money and have a great time doing it. So, what is your passion? How are you going to find your niche? The new Wal-Mart will be a Supercenter, so it will offer much more to the community in products and services, and that will give Wal-Mart a much greater gross profit. It is likely that their grocery store will take business away from Costco in Sequim, at least for the Port Angeles residents that currently drive to Sequim to shop at Costco. It is also likely that Wal-Mart’s grocery store will hurt the Safeway store nearby. For anyone who has been in a Wal-Mart Supercenter, you know that their grocery store is pretty impressive, has fresh produce, and the prices are unbelievably low. The other logical reason Wal-Mart builds a new store and leaves the old is a defensive strategy. The old property will eventually go up for sale no doubt, but you can be sure that Wal-Mart will have a restrictive covenant that prohibits the property from ever being used by a competitor. Pretty smart strategy, isn’t it? Port Angeles can be thankful that at least one big corporate store is building in town. For the past decade Sequim seems to have been getting all the large anchor businesses.